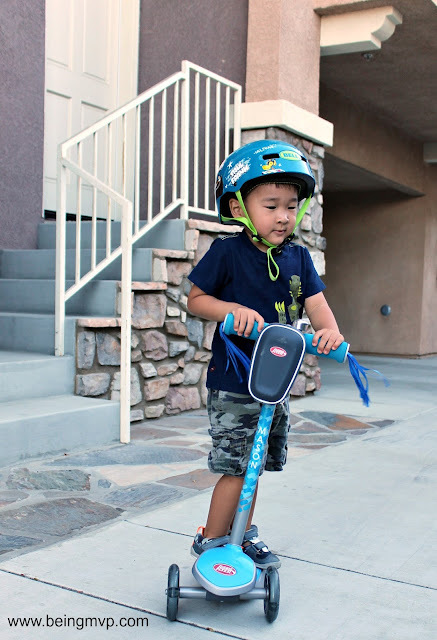 Disclosure: I received a Build-A-Scooter for review. All opinions are my own. The weather has been really great recently so the kids love playing outside. So guess who was super exited to finally have his own personal Radio Flyer scooter? He has been eyeing Kenzie's classic Radio Flyer scooter for some time and has even gotten a few rides in. However, when his flashy new one came and I pointed out his name - he couldn't wait to hop on - after packing up some cars, of course. I love the new Build-A-Scooter option from Radio Flyer because you can customize it to fit your child's personality and needs. The process is really simple as you just go step-by-step on the Radio Flyer site and you can see the preview of your selection right there on the screen. I decided to go with the blue scooter with the Rhythm design. 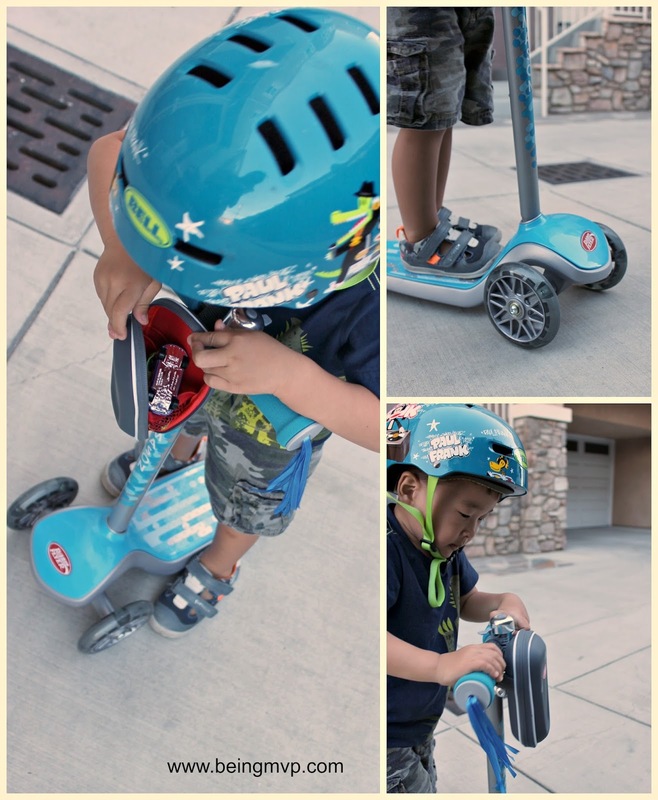 You can then add any of the following options: speed activated light-up wheels, storage case, bell, streamers. 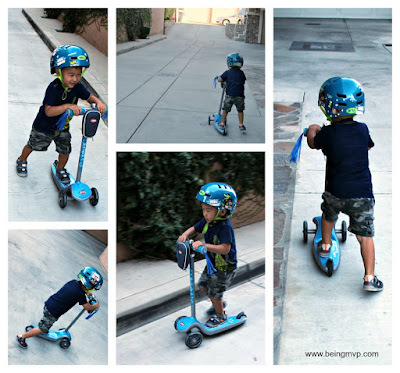 Or just max out the scooter by making it the Ultimate Ride with all the options (which I did for Mason). I think customizing the scooter with your child's name is a must option. Your child will definitely love seeing their name and you can rest easy when she/he totes it along to school or play dates. 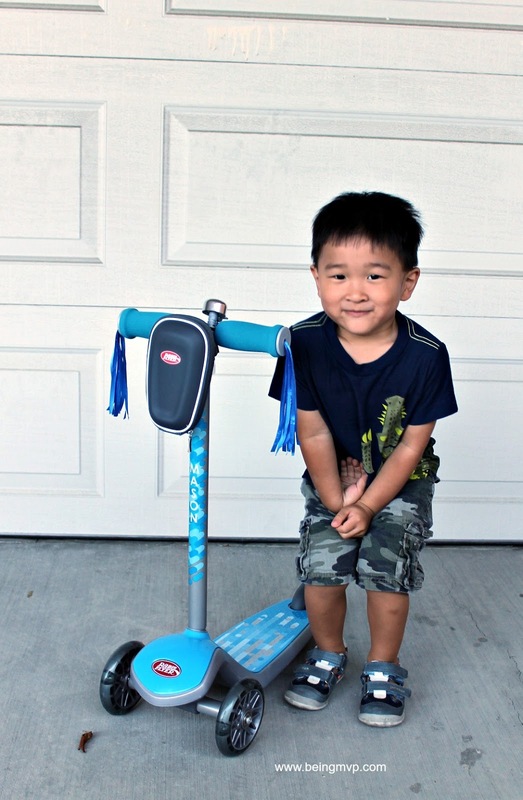 The Build-A-Scooter comes complete with a thank you letter, certificate of authenticity and also an optional gift message. This is an amazing scooter that offers stability yet with lean-to-steer technology that makes for a sweet ride. It is easy to adjust the height and your child will laugh in glee when they pick up speed and the lights come on. Mason began picking up the scooter skill in no time and is now able to join in on Kenzie's scooter fun. Do you have a birthday coming up or have you started shopping for the holidays (Christmas in July)? Check out how easy it is to customize the Radio Flyer Build-A-Scooter and get ready to see big smiles on your tot! what a great idea for a gift. seems like a reasonable price too for something a kid can custom design ! That is one of the coolest scooters I have ever seen. Radio Flyer has been around for a long time and it's a company I trust so this is one I wouldn't hesitate to purchase. That is so awesome. I love that you build it for your child and customize it. This is on my son's birthday list. My son would love this--I'll have to keep it in mind for Christmas.